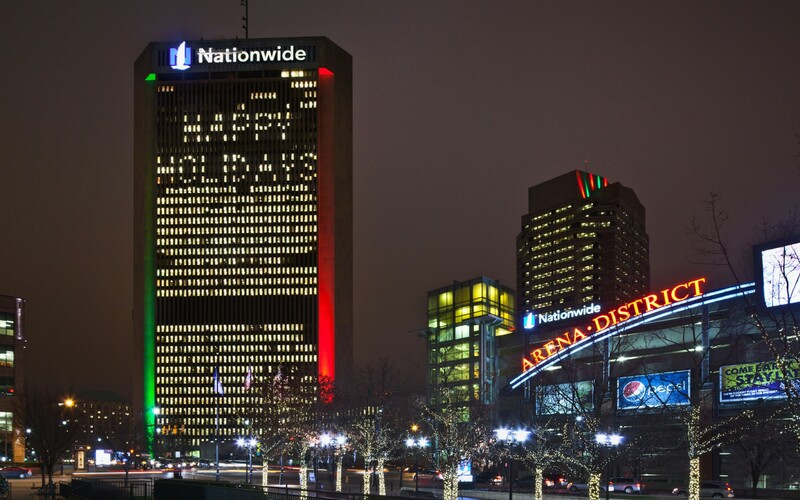 At the Nationwide Plaza complex, Lighting Systems of Columbus Inc. (LSC) used Lumentalk technology to convert the lighting systems to LED. With Lumentalk, existing electrical infrastructure can be reused for data, keeping conversion costs low. 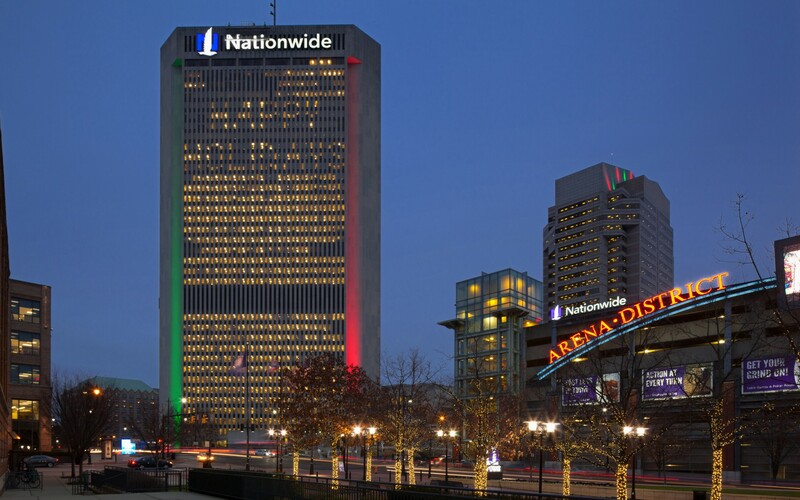 One Nationwide Plaza had previously been lit with 1000w metal halide lamps that required colored gels. The firm replaced these metal halide fixtures with Lumenbeam LBX RGB luminaires. The switch cuts power usage by 85% (from 40,000w to 4,800w) and allows for easy programming. 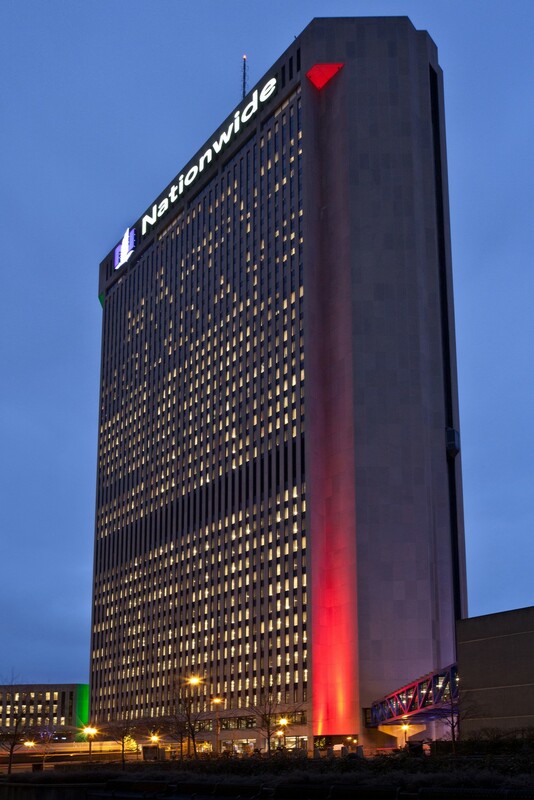 At Three Nationwide Plaza, 1000w PAR64 Halogen lamps were replaced with RGBW versions of Lumenbeam LBX luminaires. 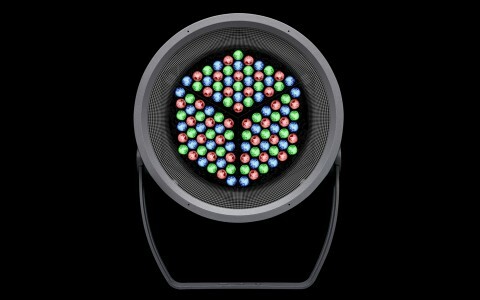 The result maintains the original lighting concept, but again cuts energy and operational costs. Lighting Design: Lighting Systems of Columbus Inc. 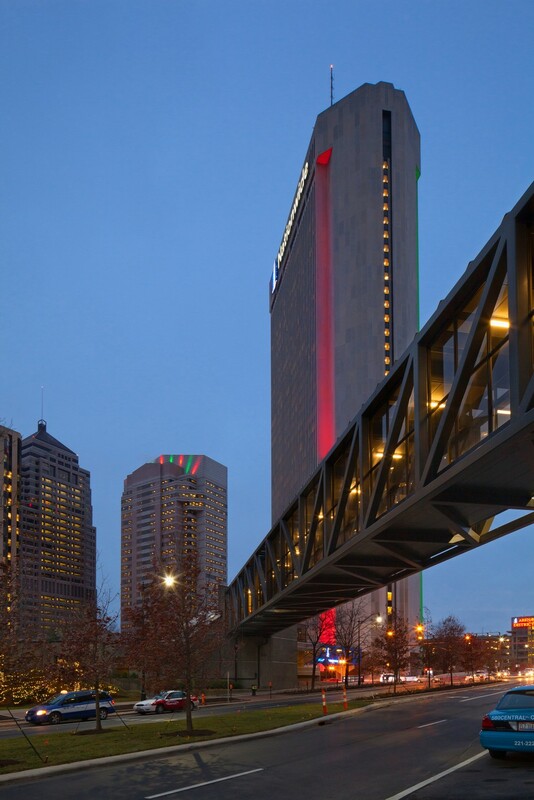 Lighting Systems of Columbus, Inc. used Lumentalk technology to bring a programmable LED lighting scheme to the Nationwide Plaza towers - modernizing the original lighting systems, without costly and disruptive rewiring. By allowing us to use the existing power circuits, Lumentalk simplified the conversion process and made it much more cost effective. It played a big part in the success of this project. 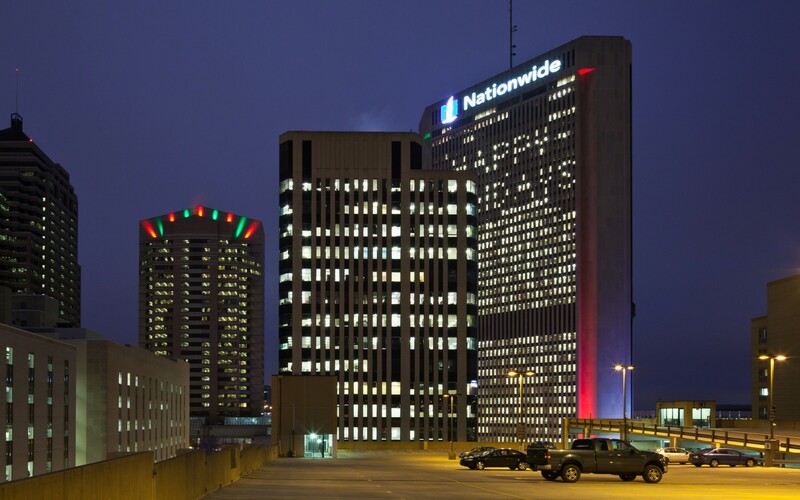 Lighting Systems of Columbus, Inc.
At the Nationwide Plaza complex in Ohio, Lighting Systems of Columbus, Inc. used Lumentalk technology to upgrade the lighting systems on two iconic towers, reducing unsustainable energy usage and simplifying labour-intensive operation. 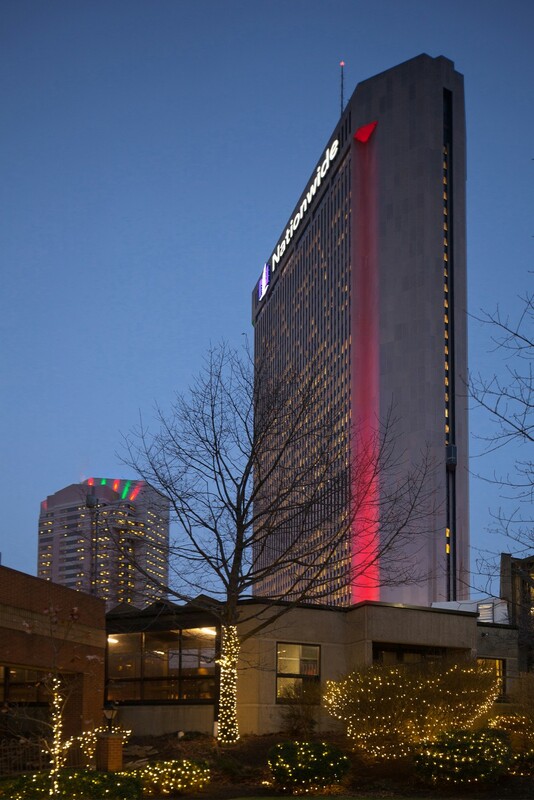 "Nationwide had been pleased with the original lighting concept for these buildings, but high power consumption, frequent lamp changes, and the need to change color filters monthly were driving their search for a better solution," said Gordon Vink, principal at Lighting Systems of Columbus (LSC). "The idea was to keep the existing lighting concept, but do it better!" he said. 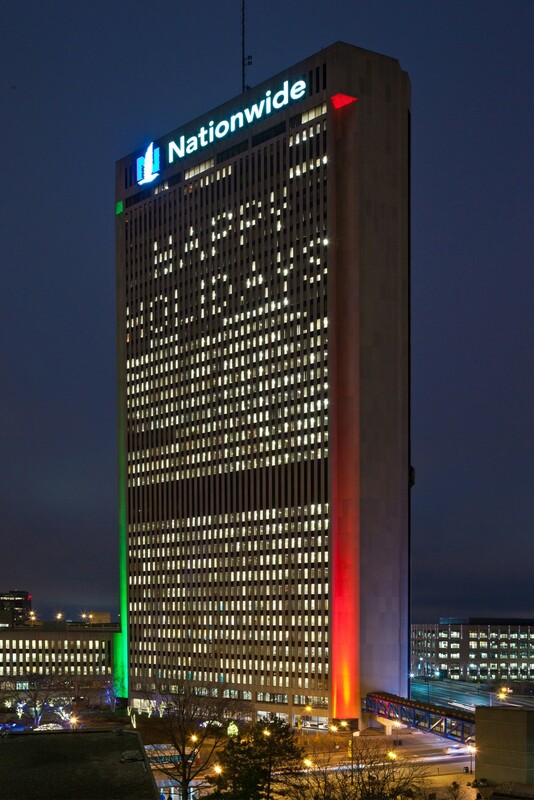 At One Nationwide Plaza, the original lighting concept involved illuminating the four inset corners with colored shafts of light aimed at the top of the building. The corners had each been lit with ten 1000-watt metal halide fixtures, resulting in over 40,000 watts of consumption. Changing colors was equally costly, as it required manual gel replacement on a monthly basis. To overcome these operational issues, LSC used Lumentalk technology to re-use the electrical infrastructure already in place. Lumentalk enables any digital control protocol to be carried over AC power lines, making it unnecessary to install new cables for data. With this technology, LSC was able to replace the ten 1000-watt metal halide fixtures on each corner with just six Lumentalk-enabled Lumenbeam LBX Color Changing luminaires. 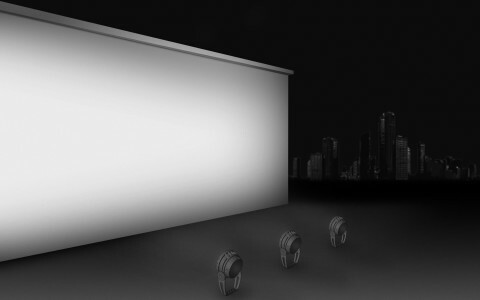 This preserved the original design but reduced power consumption to 4,800 watts - while giving the client the ability to easily reprogram lighting for events and special occasions . "The first time we tested it, we still had the original lighting system in the opposite corner, and the new LED system completely exceeded expectations," Vink said. "There was no comparison to what was there in terms of the ease of control and energy savings, plus the visual performance was better," he said. At Three Nationwide Plaza, nine individual beams of light create a crown at the very top of the building. 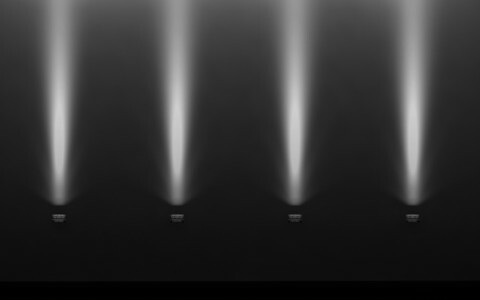 Previously, each beam was produced by two 1000-Watt PAR64 Halogen lamps aimed to create the appearance of a single beam. These fixtures were replaced with Lumentalk-enabled, RBGW versions of Lumenbeam LBX Color Changing luminaires, which again significantly cut energy usage and color-changing labour. 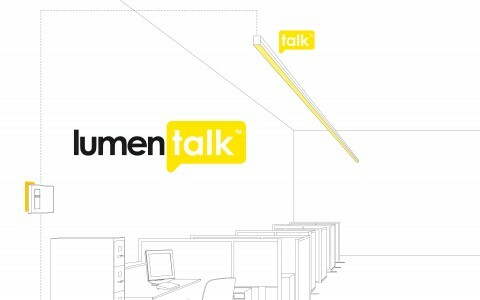 "By allowing us to use the existing power circuits, Lumentalk simplified the conversion process and made it much more cost effective," Vink said. "It played a big part in the success of this project."